Fishermen in Rameswaram have alleged that the Coast Guard ship personnel had fired rubber bullets at the Jehovah Jireh crew. CHENNAI: The Mandapam Coastal Security group on Tuesday registered a First Information Report (FIR) against the Indian Coast Gaurd (ICG) for allegedly firing at Rameswaram fishermen. The Rameswaram fishermen alleged that the ICG had opened fire at them on Monday, however, the latter denied it. The ICJ also added that no injuries or bruises have been inflicted by any of its personnel by firing as alleged. Meanwhile, the Rameswaram Fishermen Association passed three resolutions against the ICG. The resolutions demanded immediate action against the culprits and compensation for the injured victims. The FIR has been registered under Sections 323 (voluntarily causing hurt), 307 (attempt to murder) of IPC and Section 27(1) of the Arms Act, 1959. 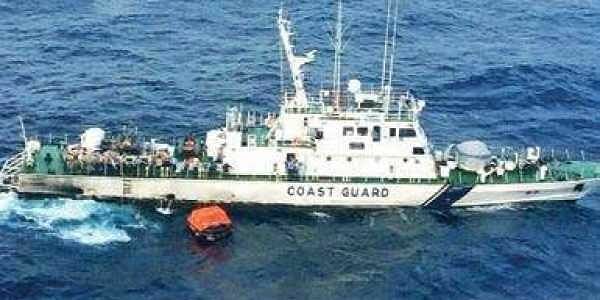 The Coast Guard on Tuesday denied firing at Indian fishermen in Palk Bay, the strait between Tamil Nadu and Sri Lanka's Mannar district. In a statement issued here, the Coast Guard said no fishermen aboard the Jehovah Jireh boat were fired at on Monday. A Coast Guard vessel on patrol off the Indian Maritime Boundary Line (IMBL) was routinely investigating the fishing boat Jehovah Jireh for paired trawling. "As the Coast Guard vessel approached, the fishing boat tried to leave the site, abandoning their the nets in the water and did not stop despite repeated warnings. "During the chase, the boat rammed the Coast Guard ship. The boat was finally stopped and boarded after a chase of 50 minutes. The boat crew was interrogated," the statement added.